Since this is a daily builds PPA, it's nowhere near stable so use it at your own risk! Once installed, you should find a new shortcut in your menu / Dash called "Nightly Web Browser" (not Firefox!). Works for me on Ubuntu 16.04. 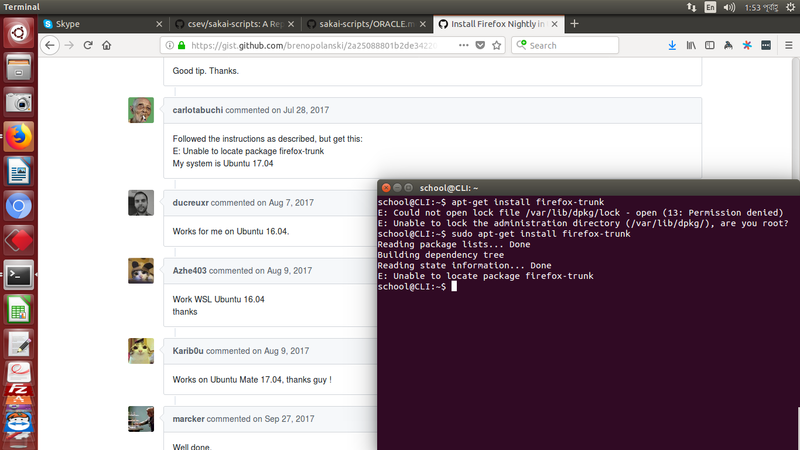 Works on Ubuntu Mate 17.04, thanks guy ! Still works on Xubuntu 16.04 LTS. Works for me on 17.10. @ivan-sig The user did use "sudo" the second time he ran the command as can be seen in the screenshot. Looks like only works on 18.04 and 18.10 right now.